Acknowledgement means so much – this is proof. It’s uncomfortable for some, but it can aid in healing for those who wish to share. Hugo inspires happiness in remembrance to his mother, even if accompanied by a bit of sadness, it is likely so much better than saying nothing. Since the death of my baby son Hugo earlier this year I have been overwhelmed with love, kindness and support from family, friends, strangers I have met and new friends I have met online. Very few of these lovely people were able to meet Hugo. 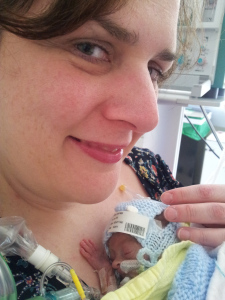 My baby was born 16 weeks early and spent the 35 days of his life in a neonatal intensive care unit on a ventilator. However, all of these lovely people know exactly how much Hugo means to me. They say his name, listen patiently to all the stories I have to tell about his spirited and mischievous character, and look at the many photos I have of my gorgeous son. They admire him, and agree that he was a wonderful baby. This entry was posted in Grief, Inspiration, Other Bloggers by staceytangerineowlproject. Bookmark the permalink.